If one loves Mediterranean food one loves olive oil. As promised, I will now tell you what to do if you do not live near our deep blue sea and want to make a wonderful bruschetta like that one above. If you are looking for a good quality extra virgin olive oil, you might need to visit several specialty shops or well stocked supermarkets. If you find a promising bottle, you need to study the label in order to understand where your oil comes from. The more details you get about its origin, the better -though probably more pricey – the oil will be. Check the lable, it should tell you where it comes from. Look at the beutiful color, it’s as fresh as it gets! Big brand oils are mostly made of mixtures. 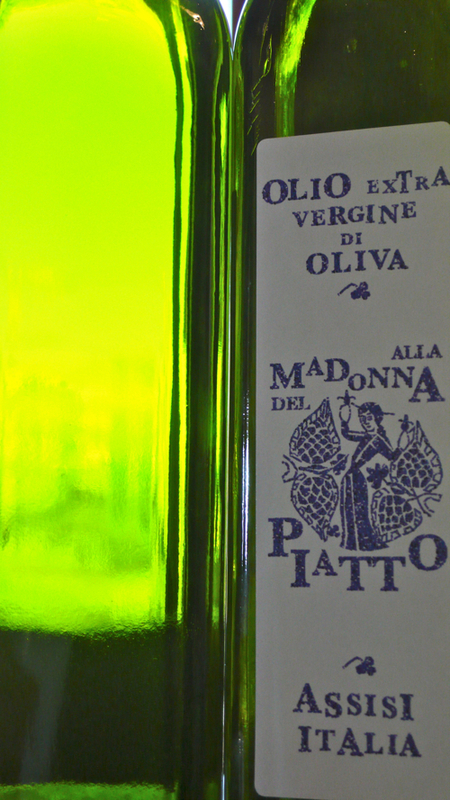 In contrast, single estate oils or oils produced by small coops of growers are made with olives of a single district. That extra virgin will have the distinctive character that belongs to its land. A complex flavor that enhances the food on which that oil is used. If you are unable to obtain a single estate oil, look for a DOP. The acronym DOP indicates that the European Community has assigned a “protected origin designation” or appellation to the area of production. For example, in our area the label of a certified extra virgin will indicate not only the region Umbria but also the district “Assisi-Spoleto”. By European regulation, high quality extra virgin in this district can only be made using 3 cultivars of olive trees, Moraiolo, Leccino and Frantoio. Each cultivar contributes to the taste and balance of flavor. Oil from Moraiolo is intensely peppery, that one from Frantoio is fruity and from Leccino is mildly sweet. Basically if you buy certified DOP or single estate you should be able to get back home with a reasonable bottle of extra virgin. Check the production date, as oil must be as fresh as possible. If budget allows take two brands to compare. On your way home, do not forget to buy some fresh bread. White crusty Italian style, no baguette please. To determine the quality, taste on a little plain bread at room temperature or even better directly from a teaspoon. Then finally, take a whole slice, toast it, rub it with a clove of fresh garlic, drizzle with the liquid gold you have conquered, sprinkle with just a hint of salt an pepper and enjoy your bruschetta when still warm. Relax, good red wine is welcome.